The hip joint is a ball and socket joint. The ball or the femoral head fits snugly into the socket (acetabulum) in the pelvis. The surface of both bones are coated by a smooth and compressible substance known as cartilage which can wear away over time leaving underlying bone. This leads to roughening and distortion of the joint and results in painful and restricted movement. 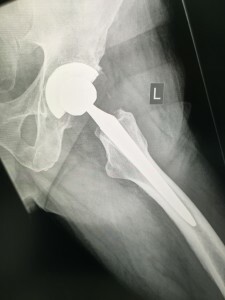 A total hip replacement (THR) replaces the worn head with a stainless steel or ceramic ball mounted on a stem which fits the femur. This sits into a new cup in the acetabulum generally also made of steel but lined with a special plastic polyethylene. 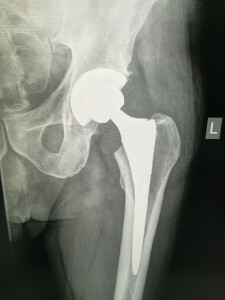 The new hip aims to reduce pain, maintain function and improve quality of life going forward. After your operation you may be given an intravenous drip or blood transfusion depending on the amount of fluid loss during the procedure. Heparin injections may also be administered daily to help thin your blood which prevents unnecessary clotting during the extended period of rest/reduced movement. A wedge pillow will be placed between your knees immediately after the procedure and you will have to lie/sleep on your back for a period of 6 weeks to maintain correct position of your new hip. Some bruising and pain is normal and can be managed with pain relief by your doctor or nursing staff. You will usually get out of bed the day after the operation with the assistance of the nursing staff. At this point you will start to walk using a zimmer frame and will progress onto crutches or sticks depending on the type of surgery you had and the expertise of the physiotherapist. This ensures you are safe enough to walk around without a member of nursing staff and all patients prior to their discharge are assessed by the physiotherapist going up and down stairs. Patients generally stay anywhere from 5 to 10 nights after their operation and is completely dependent on how well you are progressing.